The story of the Russian Blue origin has been already told. We, breeders, will continue it by developing the breed further on according to the breeding rules and standards to the benefit of its further improvement. Despite their quite modest appearance, Russian Blue cats are becoming more and more popular nowadays. The origin of this beautiful breed is deeply rooted in the past and is retold by many as a legend, according to which it comes from the area around the northern Russian city of Arkhangelsk. Historical sources mention the Russian Empress Catherine II, who often gave cats of this breed as presents to foreign ambassadors, although she personally preferred Italian greyhounds to cats. The first specimens officially representing this breed in England and who continued their spread across the country were the cats given to the King of England by Catherine the Great. Non-officially, these cats arrived in England in the beginning of the 19th century. They were brought by trade ships delivering goods from Arkhangelsk to London. On the island of Albion they were referred to as Foreign Blue or Maltese Blue, otherwise they were also called Arkhangelsk Blue until in 1939 they finally received the name of Russian Blue. The Russian monarchs were known for showing much appreciation of cats and used to have these graceful animals in palaces. Peter the Great’s father, Tzar Alexey Mikhailovich is said to have a favourite cat whose portrait is on the engraving. During his reign, Peter the Great ordered every farmstead to keep cats in barns to protect those from mice and rats and fend pests off. The Emperor himself was often depicted in a satirical manner as a cat which fact is truly evidenced by many popular primitivistic prints (luboks) having the inscription ‘Cat of Kazan (face), mind of Astrakhan (cleverness), reason of Siberia (wisdom)’. There are historical documents about Peter the Great’s favourite Vaska the cat who was royally allowed to walk freely everywhere in the palace and who enjoyed every courtier’s indulgence and tolerance. Peter the Great’s daughter Elizabeth I was said to be a true connoisseur of Russian Blues. Back in 1893, Mrs. Carew Cox of Count Essex acquired and imported from Arkhangelsk cats -Limpopo (male), Olga, Pashoda and Dwina (females). 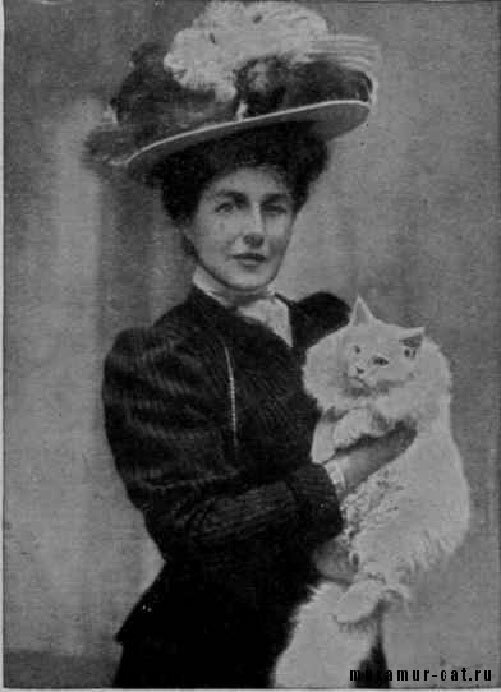 Later in 1901, she acquired a female cat Yula. Those were the first cats who started the breeding branch of Russian Blues in Great Britain. (Sources taken from ‘The Book of cats’ of Miss Simpson published in 1903.) The Russian Blue gained popularity not only through the elegancy of its shape, double plush coat with a silvery shine, but also through its mysterious Russian temperament, both modest and reserved. It possesses a very quiet voice. Even during the heat, unlike other breeds these cats preserve their quite nature and produce a gentle melodic trill rather than yowling. At the same time, Russian Blues have an excellently developed hunting instinct. All these qualities were much to the benefit of Russian Blues and distinguished them amongst the other blue cats – British, Maltese, Oriental, and European shorthaired cats. 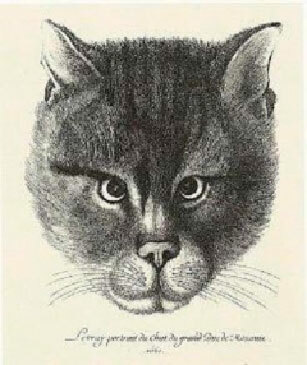 Initially, British breeders conducted their husbandry work specifically based on aboriginal Arkhangelsk cats. Because of the Russian revolution in 1917, foreign breeders experienced much difficulty in their further activity – the ‘iron curtain’ hampered import of new studs from Russia. From that moment on, pure breeding of Russian Blues abroad became impossible. British and European breeders were forced to resort to other breeds to continue their work. The biggest impact Russians received from the Siamese breeds through which Russian Blues obtained oriental features such as a wedged skull with a straight profile, large set-apart ears, long legs and short thick coat lying close to the body with a thin undercoat. The temperament of those newly bred Russians underwent much alteration too – female cats started yowling and male cats produced unpleasant stinky smells while marking their territory, which was unusual for aboriginal Russians. More intense crossbreeding between the sparse number of Russian Blues and Siamese cats took place in the USA in 50-s and 60-s of the last century. However, independent crossbreeding conducted in Britain and America resulted in certain differences in final outcomes which consequently gave rise to different breeding standards. For some time, the word ‘Russian’ was omitted from the name of the breed and it started being called Foreign Blue. That was quite a reasonable decision justified by the rules accepted in the scientific breeding. If an aboriginal breed is crossbred with some other breed, the resulting litter is considered either a half-breed (in case of casual breeding) or a hybrid (in case of intended breeding) and cannot bear the name of the breeds, from which it resulted. The litter acquires a new name and becomes the origin of a new breed. However, in 1939 a decision was made to return the original name of the breed – Russian Blue, which put an end to bringing more oriental features into the breed. To improve the hair quality and to get rid of Siamese oriental features in the new breed, British breeders started using shorthaired cats for breeding British Blues. However, having solved one problem they bumped into another – the animals were getting bulkier in their body shape, which wasn’t typical for Arkhangelsk Russians. In mid-80-s of the last century, Russian Blue returned to its historical place of origin – Russia. First pedigree cats were brought from Czechoslovakia. The exterior of those cats bore a highly noticeable oriental trace – they had an oriental profile without expressively visible whiskers pads, thin undercoat and a lack of silvery shine in the hair. These defects caused reintroduction of original Russians into the husbandry process, as long as their phenotype complied with the breed standard. Original Russians had a number of characteristics that distinguished them from Foreign Russians – they had longer hair, rounded eyes, a longer eye colourization period, on the one hand, and a thick undercoat, blue hair colour with a typical silvery tint, sharp profile, clearly visible and pronounced whiskers pads, on the other. Most importantly, they had a Siamese feature-free temperament ideally matching the Russian Blue phenotype, which proves additionally the Russian origin of the breed.